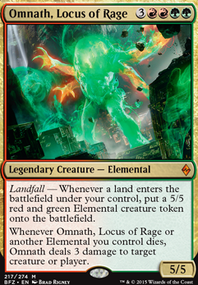 Whenever a creature with power 5 or greater enters the battlefield under your control, you may have Where Ancients Tread deal 5 damage to target creature or player. You have too much land. I know it's dinos and everything is high CMC, but I think you could do 36. My reasoning: yes, you could get mana screwed, it happens. 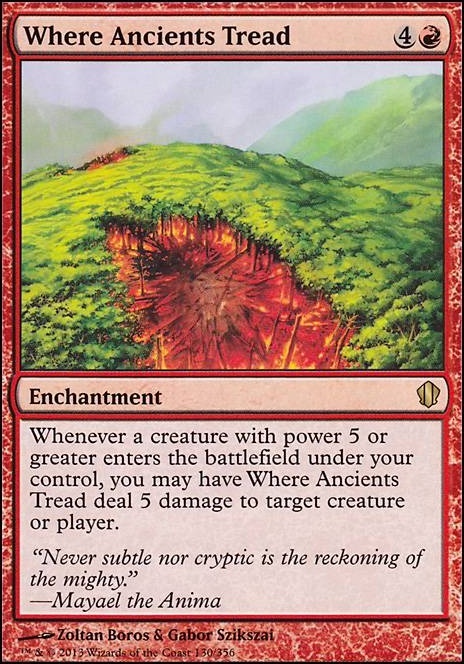 But with your rocks, cost reducers like Knight of the Stampede and Urza's Incubator , and fetch cards like Cultivate , you're at greater risk of flooding out and you have almost no ways to loot or wheel your hand. Related: in a deck like this, scry is almost as good as draw. 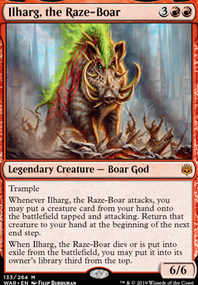 Think about swapping a card out for Lifecrafter's Bestiary - maybe lose Boros Signet (since green is your dominant color)? Maybeboard: I think you absolutely want all three of Chromatic Lantern , Lightning Greaves , and Heroic Intervention . I'd take any/all of those over Sunbird's Invocation , Farseek , or Commune with Dinosaurs , for example. Nice work with the deck - hope it's a blast to play. +1 because I started reading the description and comments in Hulks Voice and it was great. Sadly I couldn't come up with any suggestions to go with it. 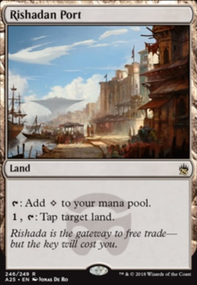 On second thought... Perhaps Warstorm Surge and Where Ancients Tread could fit in for some extra removal. 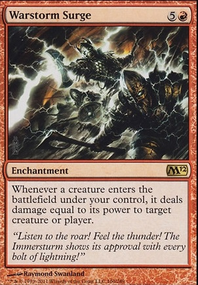 Fervor , Fires of Yavimaya , and Rhythm of the Wild are all haste enablers, or if you want to keep it more creature based there's Anger and Surrak, the Hunt Caller . Then you can smash face faster. And in the spirit of keeping The Hulk angry... Azorius has my vote. Sorry, not sorry. Thanks Madcookie. I would have tried to look up the rule myself, but didn't know where to go. Can you tell me where you found that, for future reference? And I love the card suggestions. Where Ancients Tread would be gloriously fun. Kinda mana intensive to do all that, but if that goes off, it would be great fun. Fling and Prey Upon would be fun with that, too. Yes, the each +1/+1 and -1/-1 counters cancel each other out as a state-based effect and the combo will work as per rule 121.3. 121.3. If a permanent has both a +1/+1 counter and a -1/-1 counter on it, N +1/+1 and N -1/-1 counters are removed from it as a state-based action, where N is the smaller of the number of +1/+1 and -1/-1 counters on it. See rule 704(<--this rule is just for state based actions). Finally! 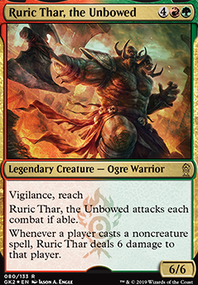 I see Atarka, World Render as a Commander! 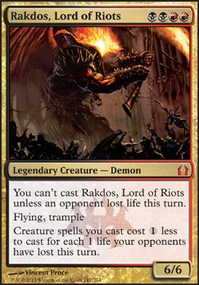 She is basically a win condition in my Dracarys deck so I have a soft spot for her. I think this deck could make use of Lathliss, Dragon Queen . I also recommend the use of Wild Pair , Where Ancients Tread and Warstorm Surge . Lots and lots of dragons, and lots and lots of pain for your opponent. 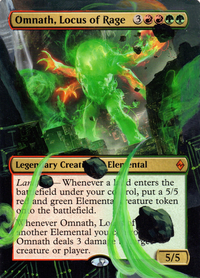 Elemental Bond would be a good source of card draw in your deck. I hope these are of help to you!